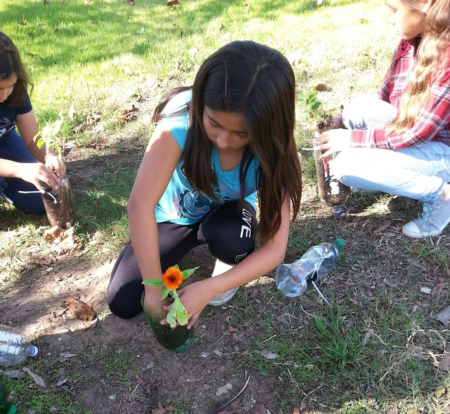 enhanced nutrition education including: planning school gardens, planting with the seasons, tasting food from the garden, connecting garden to cafeteria, working with educators and students, and providing outdoor education. UC GNEs are currently working in classrooms (pre-K through 4th grade) in San Luis Obispo and Santa Barbara Counties teaching the Learn, Grow, Eat Go! 4-H Junior Master Gardener curriculum. Classrooms that complete all lessons and develop their own service learning project may receive Jr. Master Gardener certificates. A group of UC GNE volunteers. 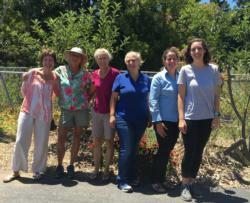 The 2019 UC Garden Nutrition Extender training will be happening Tuesdays and Thursdays from 9am-1pm July 9th - August 1st at the UCCE Office in San Luis Obispo. What are UC GNEs up to? UC GNEs are out in their communities making a difference! 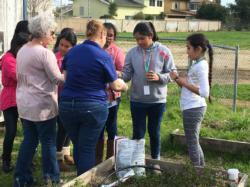 Using evidence-based curricula aligned with grade level standards, UC GNEs help teachers get their students outside, learning, eating and growing in the garden.